We all celebrated the 20-year anniversary of open source a couple of weeks ago. No doubt, the concept brought countless opportunities for lots of people in the computing industry. The movement drove new efforts like open hardware and a host of ever-popular high-profile tech conferences. Working with the Arduino and Raspberry Pi has been fun and they are generally considered open hardware. I’ve enjoyed participating with OSCON and Fossetcon, both open source oriented events. While open source has certainly been a positive part of my tech career, I think hacking and *nix (Unix, Linux, etc.) has had a slightly bigger effect on computing, at least for me. That’s just one man’s opinion. It’s been an interesting trip and hopefully, readers will indulge my memory of a few computing in-flexion points I’ve witnessed over the years. I took things apart and blew family-room fuses way back when my age was in the mid-single digits. Through the mid to late 60’s, it was tremendously exciting to watch the Gemini and Apollo rocket launches from my backyard. Hot rods dominated my late teens, including building a V-8 powered Jeep and a 1956 Chevy with a 409 and four-speed. Hands-on wrenching, welding parts together and assembling engines and transmissions in my bedroom were all great prep for things to come. Hacking all kinds of things, was a growing niche among techies of all stripes. My journey into computing land didn’t really start until taking a FORTRAN course my sophomore year (1981) at Purdue. Those were the days of the legendary big-iron mainframes. Students would crowd into one of the many basement terminal rooms in a gargantuan engineering or agriculture building and hammer out their code until the wee hours of the morning. Lighting was low, while the eerie green glow of the VT100 tubes lit up the faces of the sleep-deprived students. Grad-school CS majors grumbled every time a neophyte programmer would bother them with a basic question. The years 1980-1981 marked Purdue’s switch from punched cards to terminals. Suddenly, everything was done on the Unix command line. It was THE future. After college, in the mid-late 1980’s I ran some CAD systems for Martin Marietta. The Sun Microsystems “pizza box” machines were cutting-edge back then and their version of Unix felt like home. We even had the old “thick” Ethernet cables. I’ll never forget how mad the network boss was when he found out we tapped a live cable for a drop to one of our machines without telling him. Just like running ‘rm -R *‘ from a top-level directory as root, you learn what things you should avoid doing with time. Fast forward to the mid-late 1990’s and I found myself full time on Unix at AT&T. Comp USA, up the street, had a “boxed set” of Slackware Linux CDs for about $100. Packaged with the disks was a gigantic manual. That book was literally a bunch of man pages printed out, with some commentary and instructions mix in here and there. 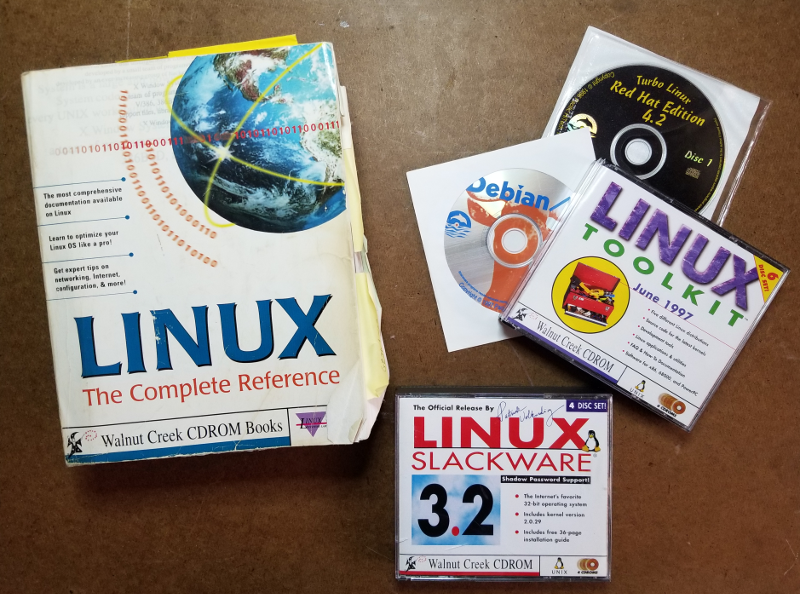 Linux was nearly identical to my beloved Unix and I promptly loaded Slackware Linux on my few-year-old 80486 desktop with a massive 20 MB hard drive. Sadly, there was no way to put Linux on the dual 720K floppy setup of the trusty old Toshiba T1100+ laptop. I can assure you it would run MINIX, which was of minimal use, at best. Although the internet had been around for years in academia, only recently could you buy a home connection over a phone modem. Using a modem for internet connectivity had its challenges. Linux expanded rapidly with CDs and home internet connections. Internet providers popped up everywhere. Lots of my friends at AT&T were moving onto Linux away from the office, of course. It was a natural jump with everybody coming from the Unix World. I remember sitting in my cube one day and discovering the web. What the heck! There it was, all the knowledge in the universe, right there on my monitor screen. The paradigm fit perfectly with the hacker/explorer Unix mindset. Computing hardware ramped up steeply in the late 1990s, too. You could finally get laptops with hard disks, CD readers, quite a bit of RAM and pretty powerful processors. Putting Linux on a laptop took work. It sure beat running ANY version of Windows at the time. Well, that was my experience, anyway. The Microsoft vs. Linux war heated up and being “Slashdotted” became a badge of honor. Slashdot was, and still is, a tech news site with a huge following. Most servers of the time couldn’t handle the page view load if your site was linked on Slashdot and would promptly crash. That meant that lots of people hit your site and you were popular. Brian Proffitt, an editor for Linux Today, published my first article about an elementary school using Linux, sometime around 2001. This was pivotal for yours truly, as Linux and writing were an awesome combination. You could research virtually unlimited topics on the Web then put together how-to’s that people were anxious to read and get paid for the work. You could download and review applications as they were released and came online. Everything I needed was right there on the web and my Linux notebook. I definitely didn’t need Windows anymore. How cool! As I worked my way through the early days of mainstream Linux, writing stories and reviewing applications like OpenOffice.org 1.0 and the Mozilla browser, other publications started being interested in my stories. It was fun to meet editors, other tech writers and a few Linux celebs. I saw it as highly educational and a great learning experience. The community was welcoming, as well. Redhat, Debian, SuSE and Gentoo were the main distributions in those days. Check out DistroWatch if you want to see what growth looks like. I never got into Gentoo. Building my own kernels and apps from source code just wasn’t my thing. Besides, with the Gnome or KDE desktops using a PC was simply just a joy. The ever-present command line, close by on a desktop terminal, was just a few clicks away. The early and mid-2000’s were an exciting time for a dyed-in-the-wool hacker geek. Time doesn’t sleep and an even more exciting future was on the horizon. Big tech conferences were coming into their own and readily available off-the-shelf hardware was looming off in the distance. Open source definitely helped ignite those areas of tech. That’s enough history for today. We’ll have to explore those topics in a future story.